Warsaw, Poland - UEFA charged the German football association on Tuesday after anti-discrimination monitors reported seeing a neo-Nazi banner at a Euro 2012 match against Denmark. "FARE can confirm that one of our observers reported a neo-Nazi banner in the German section at the match vs Denmark in Lviv on Sunday," the group said in a statement. 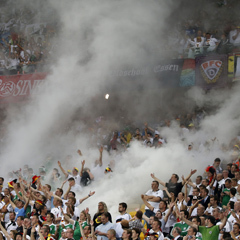 Portugal players were pelted with crumpled paper balls during the teams' first match in Lviv. UEFA fined the German association €10 000. Germany beat Denmark 2-1 to advance to a quarter-final match against Greece on Friday, in Gdansk, Poland.